What Is a Sampler Quilt? A sampler quilt is a quilting project that does not repeat the same quilt block within its layout. A large percentage of sampler quilts are designed with twelve different quilt blocks but any number of unique quilt blocks can be used in the design. A 19th Century quilt by Jane Sickle is an intricate sampler made up of 225 different patchwork quilt blocks and pieced borders. Brenda Manges Papadakis drafted and published all of the tiny blocks used in that quilt and today there are thousands of 'Baby Jane quilts' that have been made by quilters worldwide. Some of the quilts in this gallery were made from my First Anniversary Sampler quilt pattern and they're an excellent example of just how different quilts can be even when sewn from the same instructions. Variations of the Scrap Happy Sampler Quilt pattern are represented in the gallery, too. You don't really need a special quilt pattern to make a sampler quilt. Find a layout you love and replace its quilt blocks with a variety of designs of the same size. Search my archives to find same-sized quilt blocks. Try the Medallion sampler quilt pattern if you're looking for a small project. The design is mostly made up of 6" square quilt blocks, with a 12" block at its center. Use this easy quilt layout with patchwork sashing and cornerstones to make a quilt with any 12" square quilt blocks of your choice. Use simple sashing and cornerstones to surround any group of quilt blocks. Another layout option is made by surrounding twelve quilt blocks with easy mitered frames that are a bit like Attic Windows quilt blocks. From Dorothy: I made this quilt from your scrappy sampler blocks, starting at the end of 2010. I really enjoyed making the quilt and tried using up lots of different scraps as suggested by you. It's far from perfect as I'm very much a novice, but I was pleasantly surprised at how it turned out. Thank you very much! I have learnt so much from your site. Note from Janet: I think that everyone will agree that Dorothy created a wonderful quilt. Use the Scrap Happy Sampler Quilt pattern link above to make your own. From Buffy: "My friend bought me the book The Farmer's Wife Sampler Quilt, from Krause Publications. There are 111 different blocks in the book and I made all of them from my scraps, along with a few quarter yards here and there. It is close to a king size quilt. Beth's Red & Green Sampler Quilt. Sampler Quilt by Beth S.
From Beth: I started quilting three years ago and joined the Bulls Gap Tennessee Guild. We held a monthly quilt block raffle, and I made one block for me each month and one for the event. The quilt blocks in this sampler quilt are the first 12 quilt blocks I ever made. The quilt measures 54 x 70. From peggianne: My full size sampler quilt is hand pieced and hand quilted. I can't say that any one thing inspired me to make this quilt, except the fact that I had a lot of blue scraps that I needed to use. From Grace: This sampler quilt was made for my great-niece as a graduation present. She obtained her BS/RN in May 2009. Such an accomplishment needed a gift, don't you think? From sheilago: I made this sampler quilt in 1999 from a pattern I found online for a Millennium quilting project. Each month, a different square was posted, and then all 12 were joined together to make a sampler quilt. I added borders to make it big enough for a king size bed - it's the biggest quilt I've ever made. From Trish: This Block of the Month quilt was made from quilt blocks received from a Connecting Threads online quilting group. Such a fun time and I love the results. My husband claimed it as his. From Nancy: I made this samler quilt for our cancer donation quilt raffle. Note from Janet: You'll find the twelve blocks and finishing instructions for the quilt in my Anniversary Sampler Quilt pattern. From Jill: Our quilt group followed the blocks Janet posted and each made our own anniversary sampler quilt. I used fabric from Australia and fabric we have available in Bangkok. The girls at Our Home Quilting in Bangkok hand quilted it with Aboriginal art symbols, such as concentric circles which represent water wells. I am very happy with the result and it is a gift for my sister back home in the U.S.
From KRose: This twin bed size "Bullseye" sampler quilt was inspired by Gwen Marston and Freddi Moran in their book Collaborative Quilting. I machine pieced each section, not knowing how it was going to all fit together until the end. I then had it quilted on a long-arm machine. From Jennifer: This quilt was made from a sampler quilt block swap. This quilt is very special to me because it reminds me of all the special friends I have made on the forum. From Michele: This was my very first quilt. I look a class and loved it! This quilt took over a year to complete because I was traveling back and forth to California to visit my little sister who was battling (and won!) pancreatic cancer. She is 19 now and an inspiration to me. The bright colors of this quilt remind me of her. I love you, Hallie. The quilt measures 47 X 60. From Sherri: I made this quilt from a swap. The blocks just had to be purple and I got a wonderful variety of different purple blocks and made this sampler that I actually kept for myself! 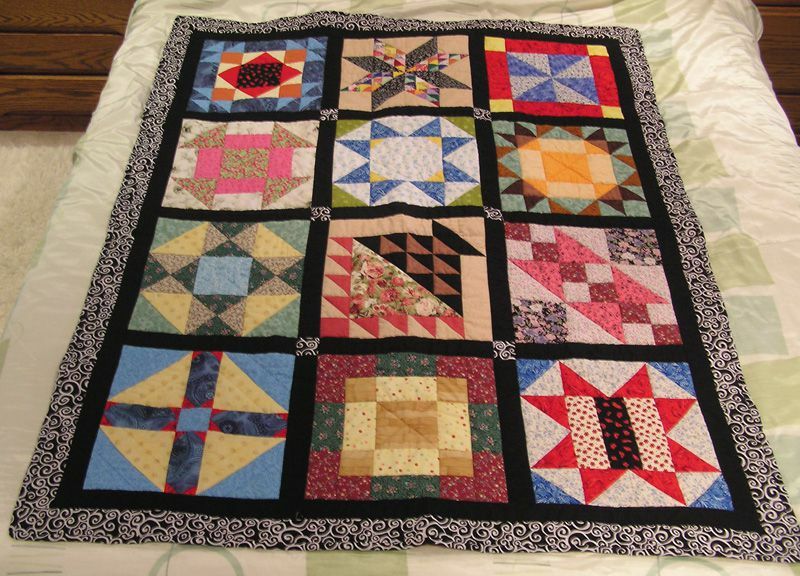 From Momofll: "This quilt, completed in December 2005, was made with blocks I swapped in the Use Up Your Christmas Stash Star Swap in the fall of 2002, just after I joined the quilting forum. It was my first ever stash quilt. The quilt is made from half of the blocks I received -- the rest are still waiting to become a quilt. I gave the quilt to my mother for Christmas 2005... all of the Christmas fabrics I used had come from her stash, as I didn't have a stash of my own at that time."